Soy sauce - a fine basis for pickling. It impacts to meat special relish and aroma, and the remains of heated-up marinade in a foil can be used then as gravy to make a crust of ready boiled pork of more juicy. For this recipe choose a beautiful integral piece of a pork balyk and you receive a smart dish in house conditions. pork balyk – 400 gr. soy sauce – 4 tablespoons. dry basil – 1 tablespoon. the French mustard – 4–5 tablespoons. bay leaf – 4–5 pieces. Put the washed-up piece of a pork balyk in a deep bowl or a small kastryulka. Fill in meat with warm boiled water. Add soy sauce, salt and spices. Do not touch mustard and garlic yet. Leave meat in marinade for 6 hours. Squeeze out garlick shares via the spadefoot and mix with the French mustard in a separate drinking bowl. Get a balyk from marinade and rub with salt. Put a cut on a piece of a foil and rub with mix of garlic and mustard. 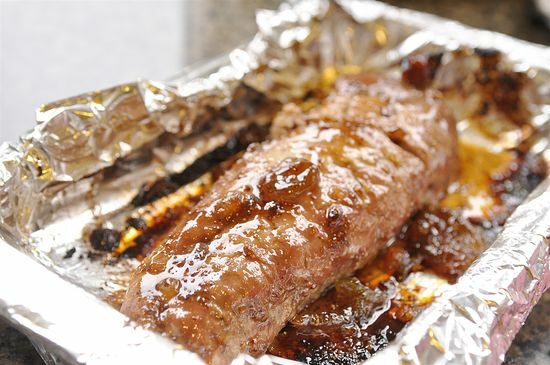 Wrap pork in a foil and put to be baked in an oven at 190 degrees. In 1,5 hours open the top layer of a foil and let's meat almost ready from within be baked to slightly dark crust. 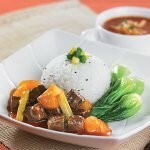 To ready boiled pork let's time cool down, and then give to a table in a combination to the fresh or baked vegetables. 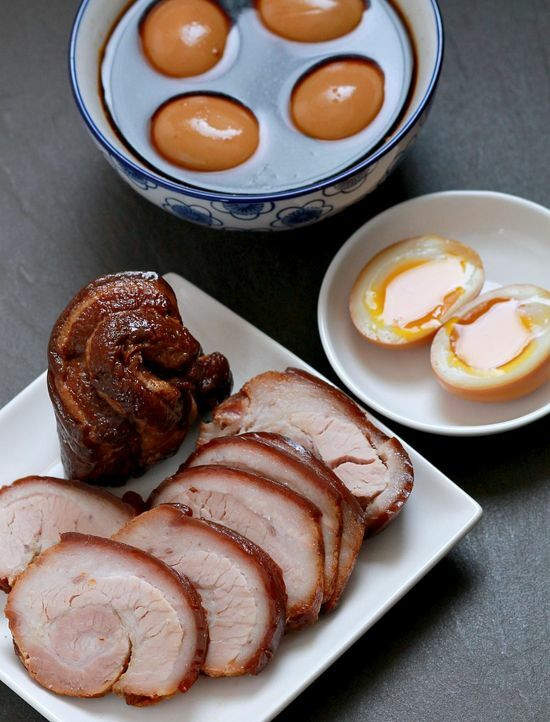 It is much easier to prepare boiled pork from chicken, than from pork. Chicken meat is much quicker baked thoroughly and practically there is no threat that fillet remains crude from within. In the same way, as well as for pork and beef, the best basis of marinade – soy sauce and spices. For boiled pork from chicken fillet it is best of all to add the following spices to marinade: turmeric, basil, red pepper and dried garlic. Chicken boiled pork will turn out very soft and gentle. 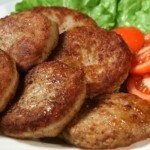 It is possible to combine such meat with plum, honey or orange sauce as a distinguished delicacy. 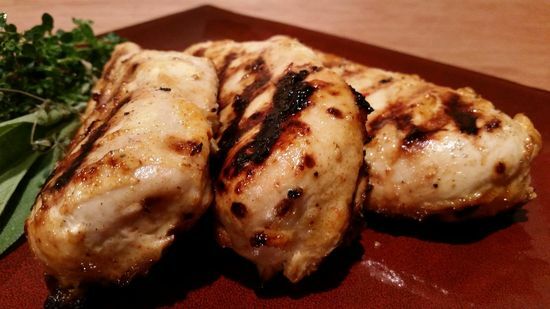 chicken fillet – 4 pieces. spices for chicken – 1 tablespoon. Enclose chicken fillet in the container or a deep bowl for pickling. Fill in meat with soy sauce. Salt and spices also leave Vsypte to be pickled for 3 hours. 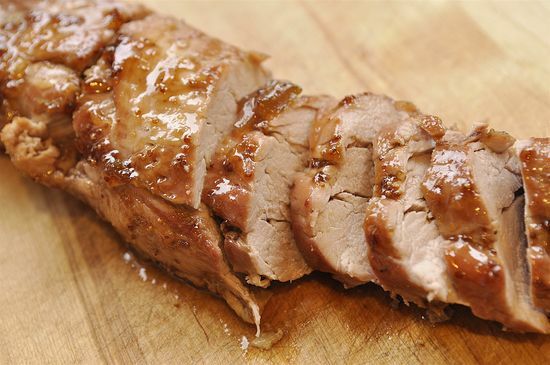 Impregnated with soy sauce and spices of fillet roll up separately in a foil. Send to the oven warmed to 190 degrees. 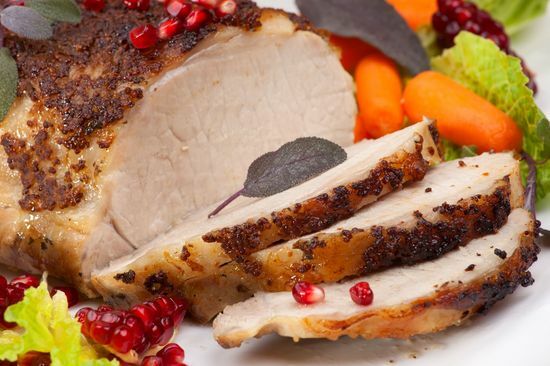 In half an hour unwind boiled pork from chicken and bake 30–35 minutes on a lattice or a foil. It is better to give a ready dish to a table the whole hot pieces or the cooled-down thin slices. 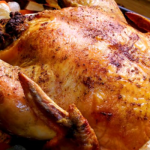 Honey with mustard create incredibly fragrant crust for any meat in an oven. For juicy, karamelizirovanny boiled pork not the fresh balyk, but a loin of a pig is used. At the correct preparation meat turns out moderately ruddy and very tasty. piece of pork fillet – 400 gr. May honey – 2 tablespoons. mustard French – 2 tablespoons. 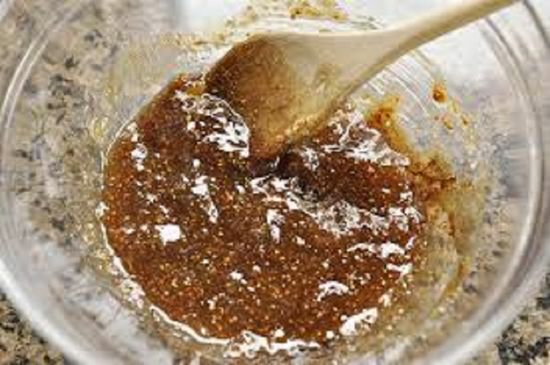 mustard pastelike – 1 tablespoon. bay leaf – 2 pieces. pepper ground – 1 h. l.
oregano – 1 h. l.
Fill in meat with marinade from boiled water with pepper, I will merge, an oregano and bay leaves. Leave for 2 hours to be pickled. In a separate drinking bowl mix two types of mustard and amber May honey. Rub the piece of meat impregnated with marinade with mix from mustard and honey. 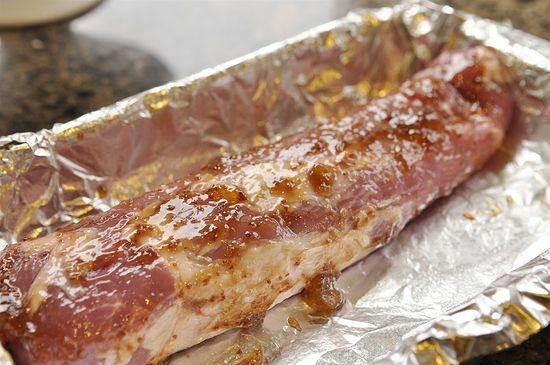 Wrap boiled pork from pork in a foil and send to be baked in the warmed oven. Serve ready boiled pork to guests or for family dinner in the cooled-down look. Cut meat with thin slices and water with the remains of honey and mustard sauce.